Last evening was the event that has for me been for many years one of the highlights of Advent. It was time for me to work for three hours on the Nürnberg Christmas Market, selling stars for children-in-need. You can see me posing between the action in the photo above. The evening was a nice rounding-off for my work until next Monday morning. It was wonderful to get up this morning, break my fast for as long as I wished, sit at the table in the kitchen beside the Advent’s crown, drink as many cups of tea as I wished, followed by a delicious pot of Advent-present coffee. Then sit down to write a blog. All this without thinking that I should be doing something else. There wasn't time for anything else, anyway! 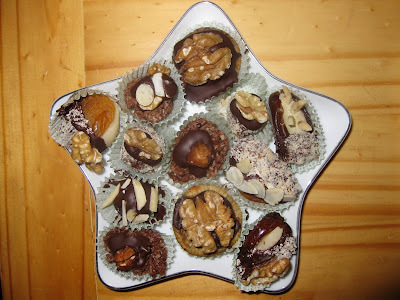 Throughout the day, however, I found time between that first posting of the day and this one, to write a couple more things, wrap presents, finish reading a book in the bath, and to make over one hundred Christmas sweets, as seen above. I have sewn two Christmas-present hand-painted cushions, and wrapped everything ready for early afternoon tomorrow when Christmas in Germany really begins. Now it is time for another cup of tea and an hour at my computer communicating with friends in Cyberspace. I am feeling quite pleased with myself, as I had decided that I was going to enjoy Advent at a slow and leisurely pace whenever possible, Making time to meet with special friends, do lovely creative projects with the children at work and not to do unnecessary shopping for Christmas. I had no intention of fighting my way through the crowds in the city to spend lots of money, as planned I got my Christmas tree early and spend a couple of relaxing evenings decorating it. More about that later. It is a nice feeling to have successfully achieved exactly what I planned four weeks ago. I am now sitting under the Christmas tree beside a pile of presents, with time and energy to spare to write. And I have at least three more days' holiday! Last evening I joined two colleagues and a couple of well-known local politicians to sell stars for charity. The well-known faces soon gathered a crowd around them, raising three-hundred euros in just an hour by selling the handmade stars. That was quite an achievement, I don’t think that the famous TV stars who come and lend a hand do any better. The star-making and star-selling is organised by a charity run by a Bavarian television company that raises money for children-in-need through gala events, TV shows, and these market stalls in Regensbürg, Nürnberg and Munich. 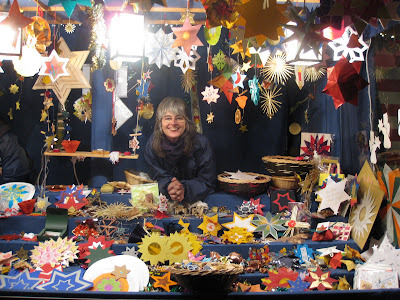 Volunteers from organisations that receive some of the donated monies are invited to man the stall for a day during Advent to sell the stars created by children from local schools. The stall has been on Nürnberg’s market since 1996 and I have been there for six or seven of those years. I usually meet up with the same colleagues on this occasion. To close off the special evening we descend on the Bratwürst Röslein to warm up and to drink a glass of wine or beer. This year was no exception. I look forward to being invited again next year. Bratwurst Röslein -The Bratwürst Röslein is a restaurant behind the main square and Town Hall, that supplies the people manning the stall with coffee, Glühwein, Bratwurst and a toilet throughout Advent.